Our quart size Pork Rinds are carefully cooked and ready to eat. They are a product of U.S.A. and are packed under the strictest Department of Agriculture standards. 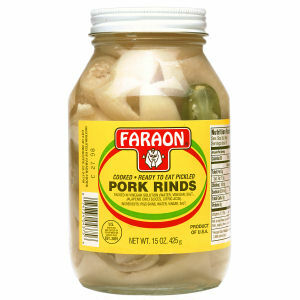 It comes in a glass jar with added slices of jalapeno peppers for a delicious, crunchy taste. It is a product of U.S. and is fully inspected and passed by the U.S.D.A.